The Device Monitor shows all run-time information about your Titan One device: the input and output data, LED, rumble and battery information, CPU load and the loaded slot/bytecode. You also have access to operations such as: turn-off a wired controller, change the current slot number and unload the running slot/bytecode. It is a useful tool for check, test and debug your GPC scripts. The Device Monitor is only accessible when the Titan One device is connected to your computer by the PCPROC side port, through a USB cable. All values displayed are normalized on its percentage form, meaning the state of a button can vary from 0% (when it is not being pressed) up to 100% (when it is fully pressed). Some entries, such as analog stick, can range from -100% to 100%, where 0% is the resting position. The normalization aims to make the values more intuitive and easy to read. The naming of the input fields are determined by the controller model being in use (Dualshock 4, Dualshock 3, XBox One Controller, XBox 360 Controller , Nintendo Switch Pro Controller or Wiimote/Wii U Pro). Likewise, the naming of the output fields are determined by the console model (PS4, PS3 or Xbox One, Xbox360 or Nintendo Switch) in which the Titan One is connected to. In the screenshot below we have a Playstation 4 controller connected to the Titan One, and the Titan One device connected to a Xbox One console. The full statuses of the controller (inputs, buttons and sensors) are reported in the Input Area. Any interaction on the controller will be reproduced by these data fields in real time. If there is no controller connected a message prompting to connect one will be shown. Any input field can have its real time value plotted in the plot area. Click on a field to select it for plotting, you can have up to 4 fields selected at the same time. The Titan One device reads the input data from the controller, processes this data according to the loaded bytecode (Script or Gamepack), and then sends the processed data to the console. The results of processed data is displayed by the fields in the Output Area. If the Titan One is not connected to a console then the user can choose the output format (PS4, PS3 or Xbox One, Xbox360 or Nintendo Switch) in the respective drop-box control. 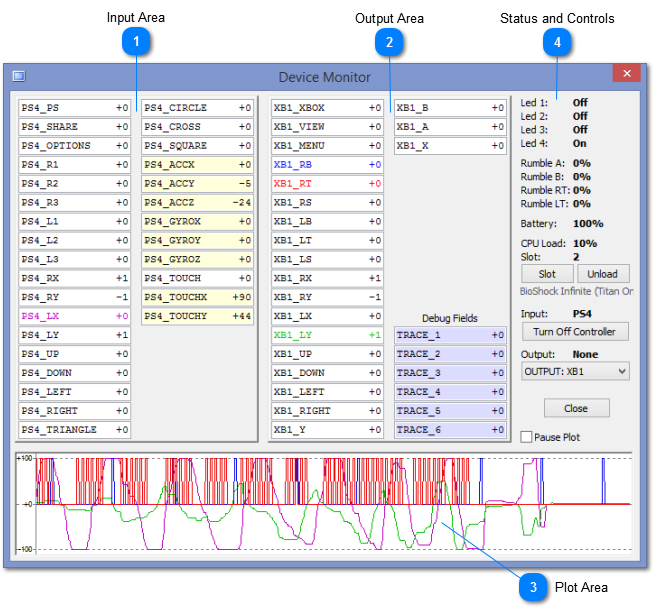 The debug fields can be used by a GPC script for feedback information, flow control checking and variables monitoring. As the name suggests, this field set are intended for debugging purpose. 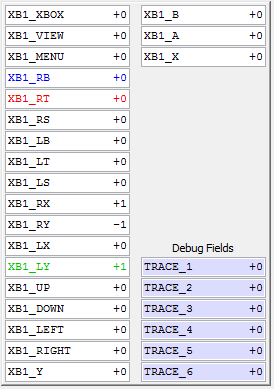 Any output or debug field can have its real time value plotted in the plot area. Click on a field to select it for plotting, you can have up to 4 fields selected at the same time. The Plot Area plays an important role for data analysis and script debugging. Any data field can have its real time value plotted by clicking on it, click a second time to stop plotting. You can have up to 4 fields selected at the same time. It is possible to pause the plotting to closely examine a particular sequence of data. • LED Status: Displays the current state of each Player LED: ON, OFF, FAST BLINKING, SLOW BLINKING. On PS3 fast blinking means the controller battery is almost without charge, and the slow blinking means the battery is charging. A GPC script can overwrite the LED state, as the example of Gamepacks, which widely use this functionality to implement the configuration menu system. • Rumble Status: Displays the current speed of each rumble engine. 0% means the rumble engine is not spinning, 100% means it is spinning at full speed. Rumble A refers the strong engine, Rumble B to the weak engine and the Rumble RT/LT to the XBox One triggers engine. The rumble speed can also be overwritten by a GPC script. • Battery: Shows the battery level of a wireless controller. The battery status parameter is not applicable to wired controllers, in this case the value shown is always 100%. • CPU Load: Shows the amount of computational work that Titan One device is performing. Any value below 80% is acceptable and means processor is able to perform all its tasks on time, without delays or lag. • Slot: Displays the number of active slot, or 0 in case of no slot is loaded. Running a GPC script by the "Build and Run" command will change this parameter to 10. • Slot Name: Shows the name assigned to the currently selected memory slot. Titan One device required. • Input: Shows the model (PS4, XB1, PS3, XB360, SWITCH, WII) of the controller connected to Titan One, or "none" in case of no controller connection. • Output: Shows the console model (PS4, XB1, SWITCH, PS3, XB360) in which the Titan One device is connected, or "none" in case of no console connection. Switches between memory slots, in the same fashion as the slot button on Titan One device. Unload any active slot/bytecode, making the device go to slot 0. If a wireless controller is in use this command will turns it off. 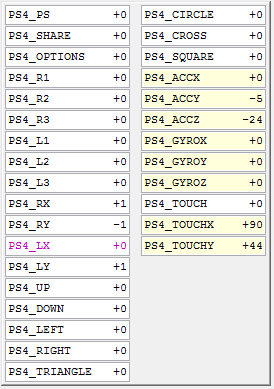 In case of no console connection, the user can choose the output data format (PS4, XB1, SWITCH, PS3, XB360) for debugging purposes. Close the Device Monitor dialog window.